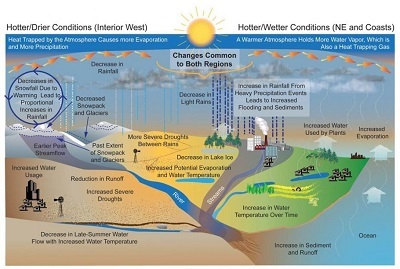 ﻿ Fun Easy English - Environment - Global warming - Climate change Impacts on Water Resources. Water resources are important to both society and ecosystems. We depend on a reliable, clean supply of drinking water to sustain our health. We also need water for agriculture, energy production, navigation, recreation, and manufacturing. Many of these uses put pressure on water resources, stresses that are likely to be exacerbated by climate change. In many areas, climate change is likely to increase water demand while shrinking water supplies. This shifting balance would challenge water managers to simultaneously meet the needs of growing communities, sensitive ecosystems, farmers, ranchers, energy producers, and manufacturers. In some areas, water shortages will be less of a problem than increases in runoff, flooding, or sea level rise. These effects can reduce the quality of water and can damage the infrastructure that we use to transport and deliver water. The water cycle (shown in the following figure) is a delicate balance of precipitation, evaporation, and all of the steps in between. Warmer temperatures increase the rate of evaporation of water into the atmosphere, in effect increasing the atmosphere's capacity to "hold" water. Increased evaporation may dry out some areas and fall as excess precipitation on other areas. Changes in the amount of rain falling during storms provide evidence that the water cycle is already changing. Over the past 50 years, the amount of rain falling during very heavy precipitation events has increased for most of the United States. This trend has been greatest in the Northeast, Midwest, and upper Great Plains, where the amount of rain falling during the most intense 1% of storms has increased more than 30%. Warming winter temperatures cause more precipitation to fall as rain rather than snow. Furthermore, rising temperatures cause snow to begin melting earlier in the year. This alters the timing of streamflow in rivers that have their sources in mountainous areas. As temperatures rise, people and animals need more water to maintain their health and thrive. Many important economic activities, like producing energy at power plants, raising livestock, and growing food crops, also require water. The amount of water available for these activities may be reduced as Earth warms and if competition for water resources increases. Many areas of the United States, especially the West, currently face water shortages. The amount of water available in these areas is already limited, and demand will continue to rise as population grows. Many areas in the West have experienced less rain over the past 50 years, as well as increases in the severity and length of droughts; this has been especially of concern in the Southwest. In the western part of the United States, less total annual rainfall, less snowpack in the mountains, and earlier snowmelt mean that less water will likely be available during the summer months when demand is highest. This will make it more difficult for water managers to satisfy water demands throughout the course of the year. Water quality could suffer in areas experiencing increases in rainfall. 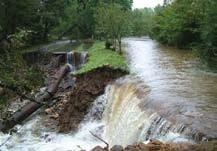 For example, in the Northeast and Midwest increases in heavy precipitation events could cause problems for the water infrastructure, as sewer systems and water treatment plants are overwhelmed by the increased volumes of water. Heavy downpours can increase the amount of runoff into rivers and lakes, washing sediment, nutrients, pollutants, trash, animal waste, and other materials into water supplies, making them unusable, unsafe, or in need of water treatment. For information about how climate change and water quality affect public health, visit the Health Impacts & Adaptation page. Freshwater resources along the coasts face risks from sea level rise. As the sea rises, saltwater moves into freshwater areas. 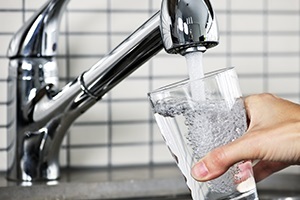 This may force water managers to seek other sources of fresh water, or increase the need for desalination (or removal of salt from the water) for some coastal freshwater aquifers used as drinking water supply. In addition, as more freshwater is removed from rivers for human use, saltwater will move farther upstream. Drought can cause coastal water resources to become more saline as freshwater supplies from rivers are reduced. Water infrastructure in coastal cities, including sewer systems and wastewater treatment facilities, faces risks from rising sea levels and the damaging impacts of storm surges. The impacts of climate change on water availability and water quality will affect many sectors, including energy production, infrastructure, human health, agriculture, and ecosystems. Picture - The Biscayne Aquifer provides almost all of the freshwater for the Keys, Miami, and the lower East Coast of Florida. Although a small part of the aquifer is beneath salty mangrove area, most of it is recharged by the freshwater Everglades. As sea level rises, saltwater will invade part of the Everglades, threatening both that ecosystem and the aquifer that lies beneath it. Warming temperatures, changes in precipitation and runoff, and sea level rise have affected and will likely continue to affect water supply and quality. 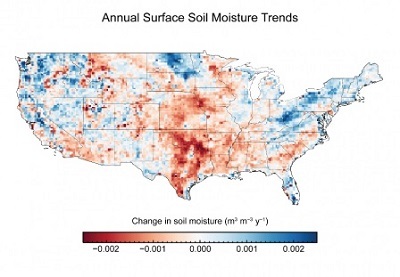 Changes will vary in different regions of the United States; potential effects include increased flooding and drought, water quality impairment, and salt water intrusion to coastal water supplies. Changes to our water resources affect many sectors, including energy production, infrastructure, human health, agriculture, and ecosystems. Increased year-to-year changes in water storage in reservoirs are possible, even under current conditions. Decreased hydropower. For every 1% decrease in streamflow in the Colorado River Basin, there is a 3% decrease in hydroelectric power generation for the region. 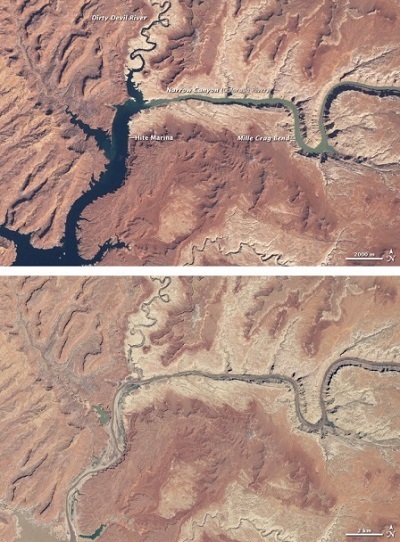 Reductions in river discharge and runoff from snowmelt. Annual snowmelt runoff could also shift to earlier in the spring. The quality of water supply in coastal and island regions is at risk from rising sea level and changes in precipitation. Rising sea level and the occurrence of drought can increase the salinity of both surface water and ground water through salt water intrusion. For example, the freshwater Everglades currently recharge Florida's Biscayne aquifer, a natural underground area that collects water and is the primary water supply to the Florida Keys. 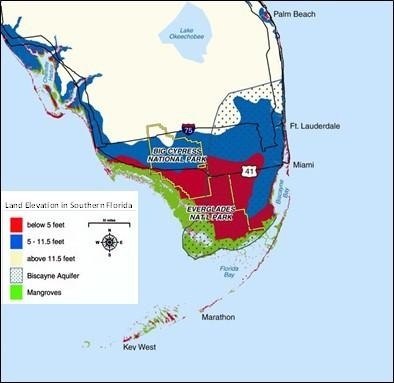 If rising sea levels submerge low-lying areas of the Everglades, portions of the aquifer would become saline. Sea level rise can also push salty water upstream in coastal areas, threatening surface water supplies. Aquifers in New Jersey east of Philadelphia are recharged by fresh portions of the Delaware River, which become saline during severe droughts. Freshwater resources on some islands, especially small islands and atolls, can be limited, as supply depends on shallow aquifers, which are recharged by precipitation. These freshwater lenses float on top of the saltwater, and rising sea level diminishes the area above sea level in which the lens can reside. (For more detailed information, see the illustration on page 158 of this Climate Change Science Program Report(320 pp, 7.6 M, About PDF)). Sea level rise can turn these shallow aquifers brackish through saltwater intrusion and droughts reduce the water available from other sources, further stressing these limited water supplies.